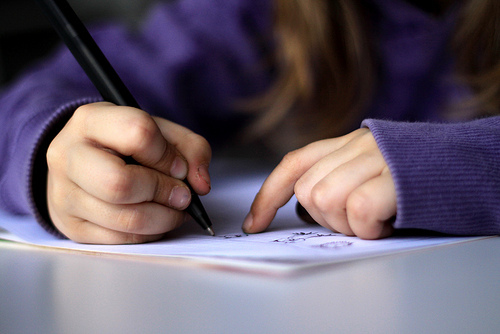 This simple, powerful writing procedure was developed by Dr. Carol Santa and her colleagues Lynn Havens and B.Valdez in 1994 and has since become something of a staple technique in the classrooms of many savvy teachers. Not only does RAFT help students remember the different considerations they should keep in mind when writing, it has huge potential for fun, creative writing assignments, particularly across disciplines. A history teacher could ask students to select the role of a colonist (details about the identity of colonist would be up to the student) and write some sort of communiqué in the format of the students’ choice to King George. A math teacher could ask students to write journal entries from the perspective of an athlete, which include different word problems as the athlete charts his/her nutrition, training, and competitive performance. A science teacher could ask students to take on the role of a negatively charged ion and compose a love letter to a positively charged ion. The ideas behind RAFT are basic enough that parents or tutors can implement them at home even if a child has not learned the method in the classroom. Simply teach your student the acronym and then have fun planning different pieces of writing together by filling in the four categories. The more guided practice children experience, the more success they will experience using RAFT independently. For more information about RAFT as it was originally proposed, see Santa, C., Havens, L., & Valdes, B. (2004). Project CRISS: Creating Independence through Student-owned Strategies. Dubuque, IA: Kendall Hunt.